While we have something to be happy for comes the end of Thursday, The Soulful Vixen has some other reasons: aside from the fact that Friday is the start of the weekend, she just happened to get a tweet from one of the most versatile actors of all-time, Mr. Alec Baldwin, who recently joined Twitter few weeks ago. I know the whole story because I am following @TheSoulfulVixen. So, it started with just a simple tweet about The Rolling Stones songs. Mr. Baldwin tweeted several of his picks. The Soulful Vixen in return mentioned ever liking “Time Is On My Side”. Charmed! And just like that, Mr. Baldwin didn’t hesitate to tweet more of his picks to The Soulful Vixen which are pretty much blues and in line with “Time Is On My Side”. And that makes The Soulful Vixen one helluva lucky girl! So what’s the big deal? 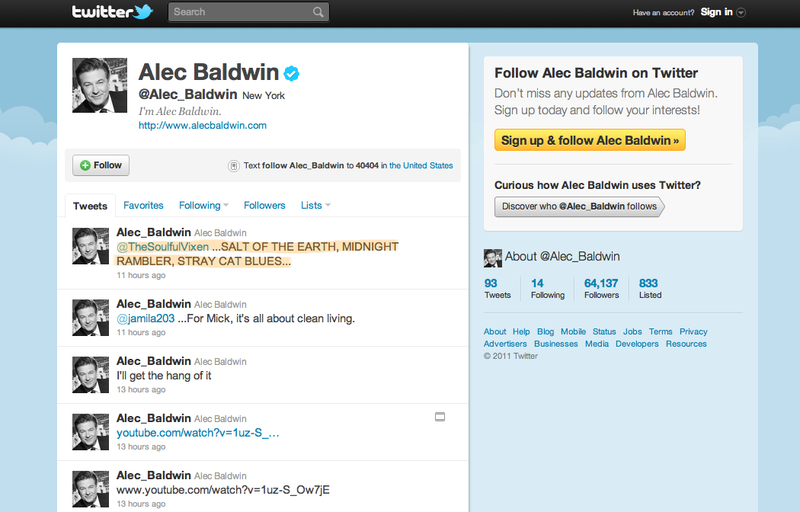 IT IS A BIG DEAL to get a tweet from the one and only Alec Baldwin. After all, he’s not just an actor you see on TV. He appears on film, stage, and television. After all, he IS Jack Donaghy from 30 Rock on NBC. After all, he starred in movies like Beetlejuice, Great Balls of Fire, Miami Blues, Alice, Prelude to a Kiss, Malice, The Getaway, The Shadow, The Juror, Notting Hill, State and Main, The Acting Class, Mercury Rising, Cats & Dog, Pearl Harbor, Final Fantasy: The Spirits Within, It’s Complicated, and a LOT MORE. Which earned him two Emmy Awards, three Gold Globe Awards and six Screen Actor Guild Awards. IT IS A BIG DEAL because out of thousands of followers he has, and millions of twitter followers that are probably tweeting him, he happened to tweet to The Soulful Vixen. IT IS A BIG DEAL because The Soulful Vixen got in to the first 100 tweets from Mr. Baldwin. IT IS A BIG DEAL because I betcha, she’s the first and only Filipino to be tweeted by a Mr. Alec Baldwin. And why not? If you want to find out, you gotta follow @TheSoulfulVixen. Pictured below is a screenshot of Mr. Baldwin’s tweet, telling it all in caps as to put emphasis on the songs he liked from The Rolling Stones. datoy sa met ti binasa ni agapi mou! lol!